Toronto Film Society presented Johnny Apollo (1940) on Monday, October 1, 2018 in a double bill with Johnny Angel as part of the Season 71 Monday Evening Film Buff Series, Programme 1. Production Company: Twentieth Century Fox. Producer: Darryl F. Zanuck. Director: Henry Hathaway. 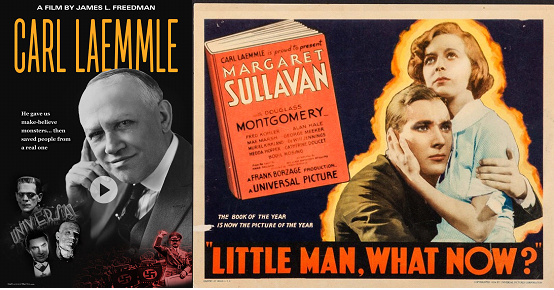 Screenplay: Philip Dunne, Rowland Brown, based on the story by Samuel G. Engel, Hal Long. Cinematography: Arthur C. Miller. Art Direction: Richard Day, Wiard B. Ihnen. Film Editor: Robert Bischoff. Music: Cyril J. Mockridge. Costume Design: Gwen Wakeling. Release Date: April 19, 1940. 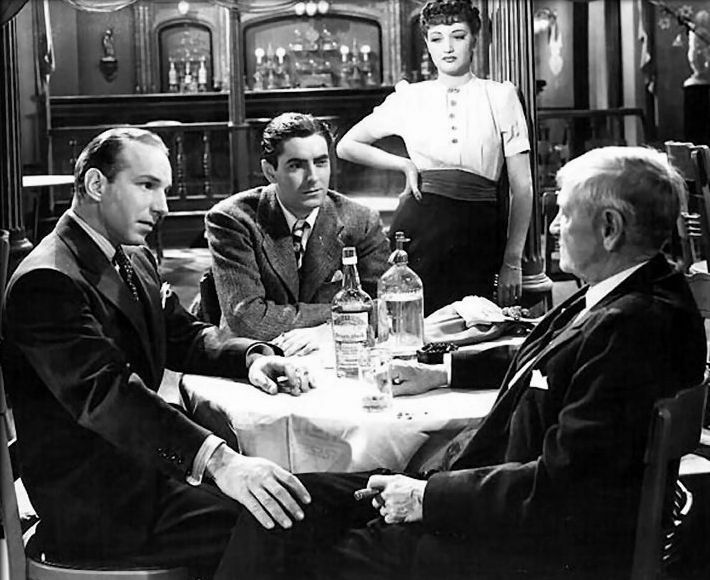 Cast: Tyrone Power (Bob Cain), Dorothy Lamour (“Lucky” Dubarry), Edward Arnold (Robert Cain, Sr.), Lloyd Nolan (Mickey Dwyer), Charley Grapewin (Judge Emmett T. Brennan), Lionel Atwill (Jim McLaughlin), Marc Lawrence (Bates), Jonathan Hale (Dr. Brown), Harry Rosenthal (Piano Player), Russell Hicks (District Attorney), Fuzzy Knight (Cellmate), Wally Albright (Office Boy), Bess Flowers (Peterson’s Secretary). Twentieth Century Fox borrowed from Paramount the beautiful Dorothy Lamour to team her with the equally handsome Tyrone Power along with a fine cast of actors including Edward Arnold, Lloyd Nolan, Lionel Atwill and Charley Grapewin who will always be remembered as Uncle Henry to another Dorothy living in Kansas. There was one absolutely gorgeous man in Hollywood I had admired from afar for several years. When I saw him in a nightclub or at a motion picture function, I would just stare. And when I was told that Twentieth Century Fox wanted to borrow me for a film with this dream man, I nearly fainted. At last I was going to work with—and more than likely, be kissed by—Tyrone Power. One of my favorite directors, Henry Hathaway, was to direct. Originally called Dance with the Devil, the title was later changed to Johnny Apollo. Of course, I tried to be very sophisticated, but privately on the inside, I was very excited. As I began to know Ty, I decided the word ‘devil’ certainly suited him. Not only was he more handsome off screen than on (and that took some doing), but he was one of the funniest men I ever met. Although I don’t recall there being a scene where thousands of balloons came floating down from the ceiling, I do agree with Lamour that, even despite her impressive body, that the “Little Abner” outfit she wears for one of her numbers, which I’m assuming is the one she is talking about, is truly unattractive. But if this was the outfit she wore sans bra, then from the looks of the stills, it must have been built right into the top. Regardless of whatever you think about her outfit, Lamour is smoking hot throughout. Tyrone Power and Edward Arnold play father and son in this film. It is not so much a film-noir or crime film as it is a father and son story. Edward Arnold plays Robert Cain, Sr., a stockbroker and Tyrone Power’s father. Cain, Sr. is convicted of embezzlement and sentenced to prison. Power’s character viewed his father as the All-American Dad, but is ashamed when he is sent to prison. Power later changes his attitude and endeavours to get his father an appeal or paroled. Meanwhile, in prison, Arnold declines a clerical position for a job as a boiler maker, a job he had in his youth. Arnold gains the respect of his fellow prisoners and guards alike, and gains the nickname “Pop” Cain. Power falls in with Lloyd Nolan’s Mickey Dwyer character and his gang, in order to gather money to buy a parole for his father. Nolan comes to treat him like a younger brother, as Power works to make enough money to get his father out of jail. Nolan has sort of a father/son relationship with Charley Grapewin, who plays the alcoholic, shady lawyer Judge Brennan. Nolan looks out for the old lawyer and mentions to Power how much he cares for the old guy. 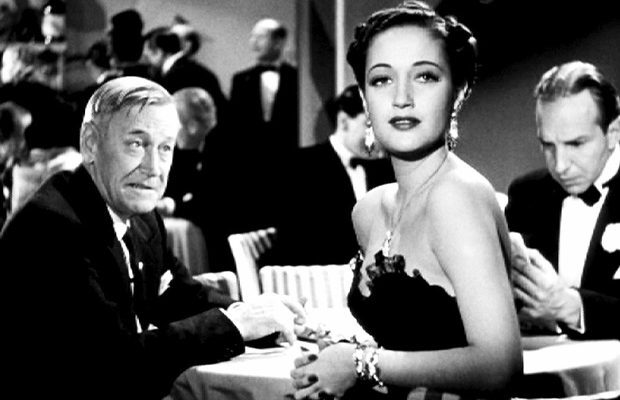 The father/son angle is summed up nicely when Power’s love interest, Dorothy Lamour, tells him that his life at the moment isn’t about him and her, but him and his father. Edward Arnold, who plays “Pop” Cain, was born in 1890 on the Lower East Side of New York City to German immigrant parents. He was interested in acting from a young age and made his acting début at age 12 as Lorenzo in The Merchant of Venice. 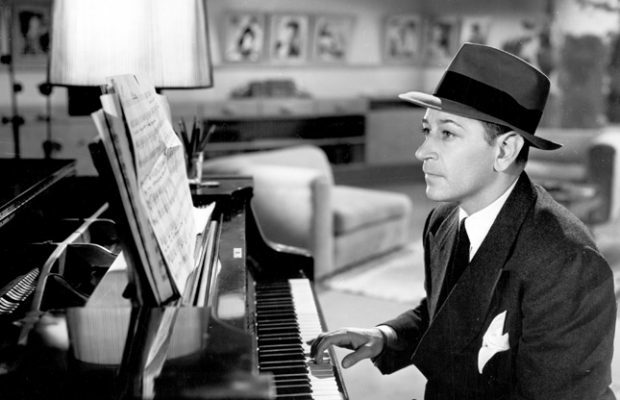 He made his professional stage début in 1907 and worked in silent films for Essanay Studios and World Studios. Essanay Studios is best known for its Charlie Chaplin films made in 1915. Arnold left films in 1919 to work in live theatre. He didn’t return to films until 1932, when he made Okay, America! (1932). He followed that with Whistling in the Dark (1933), in which he played the role that he had played in the stage version. 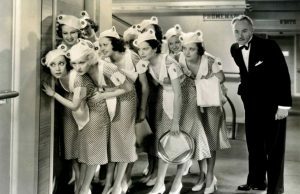 His role as Diamond Jim Brady in Diamond Jim (1935) made him a Hollywood star. He was billed above Cary Grant in The Toast of New York (1937). Arnold was a big man, and as he matured, he moved into character roles. He was quoted as saying, “The bigger I got, the better character roles I received.” His popularity with directors was such that he often worked on two films at the same time. 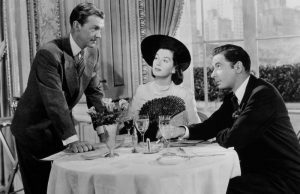 Frank Capra used him to great effect in You Can’t Take it With You (1938), playing James Stewart’s father; Mr. Smith Goes to Washington (1939), again with Stewart; and Meet John Doe (1941), in which he played the politically ambitious and heartless tycoon D.B. Norton. 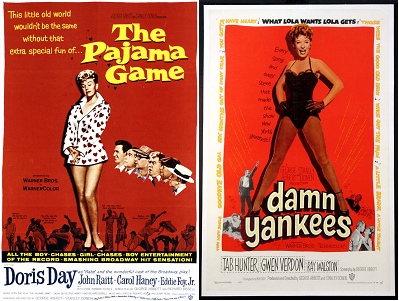 Arnold made over 150 films, despite being labeled Box Office Poison by an exhibitor publication. He was in fine company, though. Other actors who had the same dubious distinction included Joan Crawford, Greta Garbo, Marlene Dietrich, Mae West, Fred Astaire, and Katherine Hepburn. Arnold had a radio career, as well. From 1947 to 1953, he starred in the show Mr. President for ABC. He also appeared in The Charlotte Greenwood Show, as a lawyer named Mr. Reynolds. He was the host of Spotlight Story for Mutual, in 1953. In 1954, Arnold was host of Your Star Showcase, a series of 52 half-hour television dramas. He also co-starred in “Ever Since the Day”, an episode of Ford Theatre, on NBC. Arnold was President of the Screen Actors Guild (1940-1942) and co-founder of the I Am An American Foundation. He has a star on the Hollywood Walk of Fame and an honourary Doctor of Letters degree from Midwestern University. His last screen appearance was as a large photographic portrait on a wall, in director Joe Dante’s Gremlins (1984). 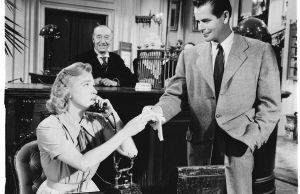 He played the deceased husband of the bank owner character, Mrs. Deagle; a rich, heartless character, much like those Arnold had played in many films. Arnold was only 66 when he died of a cerebral hemorrhage in 1956. He is interred at the San Fernando Mission Cemetery.